The cell phone straps or cellular Neck Lanyards come with detachable buckles. You can take off your phone and put it back from the detachable buckles or clasps. 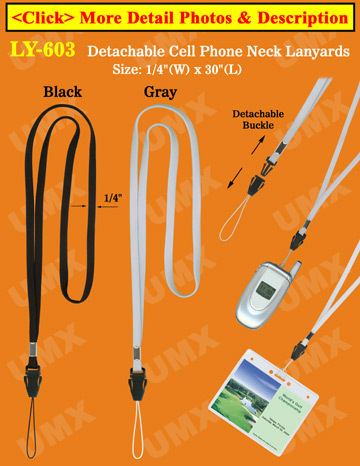 The cell phone neck straps or lanyards are made of high quality nylon material. It is not just for cellphones. The neck straps or lanyards can be used to carry cell phone accessories too. The universal string on the straps can be used to carry your flash players, flash drives, flash media, USB drives, memory sticks, camera, handheld PDA, GPS, meters and related accessories etc. Safety Buckles: Small Swingable Breakaway Buckles - 3/8"